An absolutely perfect diamond would theoretically be a stone whose crystal structure is perfectly arranged with only carbon atoms. Only, diamonds of this quality are rarely ever found, if they even exist at all. Instead, diamonds are classified into four different types, according to the "impurities" within the structure of the stone. These impurities should not be looked at as a negative trait, but rather the cause that makes each diamond so incredibly unique. These impurities are nothing like imperfections in the stone and cannot be determined with the human eye, even under a microscopic view. The only way to identify the type a stone might be is through an infrared spectrometer that measures the atomic level in the crystal lattice. According to the chemical build of the stone it will be classified as Type Ia, Type Ib, Type IIa, or Type IIb stone. Interestingly enough, one stone can actually be classified as more than one specific type of diamond, as is the case in most stones in the market today. Tests that are run on the stones in order to determine the type, are administered by organizations such as the GIA when a diamond is sent for certification. Type I is the most common diamond class in nature. These stones contain the addition of Nitrogen atoms within the crystal structure of the stones. The diamond class Type Ia is the compound element structure in most colorless stones. The addition of Nitrogen atoms in Type Ia diamonds is always in clusters that appear throughout the stone. Depending on how the clusters in the stone are broken down, the compounded elements can have an effect on the color of the diamond. • Type IaA diamonds contain pairs of Nitrogen atoms known as A-aggregates. The color of the diamonds is not affected at all due to the fact that Type IaA stones absorb no visible light. • Type IaB diamonds contains even clustors of four Nirtogen atoms called B-aggregates. Similar to Type IaA diamonds, the color of the diamonds is not affected due to the fact that Type IaB stones absorb no visible light. Most Type Ia diamonds are actually a combination of Type IaA, Type IaB, and Type N3. Type N3 is groups of three Nitrogen atoms, which actually do absorb visible light. As a result of the build, the color of these stones can contain a yellowish or even brownish tone. In fact, Cape Diamonds (which are the very beginning of the fancy colored diamond scale) are among the Type Ia diamond class. They often contain a blue toned diamond fluorescence. Fancy Colored Diamond Fluorescence Under Ultraviolet Lighting. The Nitrogen elements within the build of Type Ib diamonds are in singular form as opposed to clusters. Type Ib diamonds are far rarer than Type Ia stones, also only about 0.1% of all natural colored diamonds. They absorb both green and blue lights and often show a deeper, more intense tone of the color present in the stone. The bulk of the fancy colored diamonds out in the market, especially those with a higher intensity, are Type Ib. Type II diamond have no Nitrogen "impurities" within the chemical build of the stone. Diamonds in this class are rarer than Type I diamonds and are often both quite larger and harder. Often referred to as "Golconda" diamonds, after one of the first diamond mines discovered in India that supplied the majority of this class, Type IIa stones are the most desirable by collectors. As a result of the compounded elements within, Type IIa stones rarely contain internal imperfections and are famous for their color. White stones of this class with a D color grade are often whiter than other D grade quality stones and sometimes even unofficially referred to as "Super D" or "C" graded diamonds. Fancy colored Type IIa stones have very strong Yellow, Brown, Orange, Pink, Purple, and Red coloring. 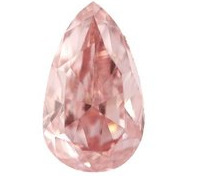 Left: 4.63-carat, fancy intense pink, Type IIa, Pear cut shape, VVS2 Clarity. Needless to say, stones of this type are not common and are a very small percentage of natural diamonds. These stones are cherished by their owners and traded often for investments. The largest compilations of diamonds in this class are from the Argyle mine in Australia and the Golconda mine in India. Similar to Type IIa diamonds, there is no Nitrogen atoms contained in the structure of these stones. However, the addition of Boron is precisely what makes these stones so unique. The Boron element is known to be the greatest cause of a blue tone within the stone. In fact, colorless stones often look better than their actual color grade and fancies of this class are often found with light blue or gray dominant colors. Left: 0.54 carat, fancy intense blue, Type IIb, Oval cut shape. Some the most famous diamonds such as the Koh-I-Noor (weighing in at 186 carats) is Type IIa. Type I diamonds are the most common. They represent 98% of all natural diamonds and have detectable traces of Nitrogen. Type Ia stones contain clusters of Nitrogen atoms throughout the crystal structure of the stone. They tend to emmit a yellowish tone. Type Ib diamonds contain Nitrogen atoms as well. Only, they are all singular as opposed to clustered groups. These stones are 0.1% of all diamonds and emit a strong yellow, orange, brown and even green color tone. Type IIa diamonds are the most valued and collectable items. They contain either very little or no Nitrogen atoms in the crystal structure of the stones. White stones are exceptionally colorless and Fancy Colored diamonds are often found with a brown, purple, or pink tone. They represent only 1% - 2% of all diamonds. Type IIb diamonds contain elements of Boron within the structure. As a result, they often emit a blue or gray tone. They represent only 0.1% of diamonds. In short, Type IIa and Type IIb stones are the most unique and collectable items. Although, especially in the case of fancy colored diamonds, since no stones are exactly alike it is important to assess each diamond on its own. One should never assume that a diamond will be perfect because it is graded a specific class or that it is worthless because it is of the more common type stones.